Premiumtraveltips.com – Bora bora is well known as one of the most impressive island in this world. This island having a called as the Pearl of Pacific by Explorer James on 1769. So for now this place is well known as the most popular and expensive place to having a honey moon and also Bora Bora popular for their beach, snorkeling and also scuba diving. What make this place is unique than the other is in here you can stay in hotel that located above the sea. This kind of hotel is special make for impress the visitor of that island. If you have the change to see this place for the sky, you can see that this place is look like the root of big tree that look so beautiful. The style of the stay place also have the same design with the local Polynesia people house. The roof is make by the Palm leaf that bring cool and comfort inside it. below the room you use to stay, you will find a deck that having a boat. from there you can roam the island with that boat. And for you guys that love to snorkeling do not forget to enjoy the beauty of Bora Bora undersea view that will be impress you. you can see a small fish dancing in front of you while crossing a very beautiful coral reef. Another favorite things to do when you visit this island is getting a tan in front of your room while enjoying the beauty of sunset. A cup of hot tea can be a perfect match for this. If you are lucky enough you also can see Polynesian Show that is the show of local people dance while hearing a traditional music in there. This show only happen once in a week. For another impressive experience on this island, you can go to higher place on this island which is the peak of Otemanu and Pahia Mountain. 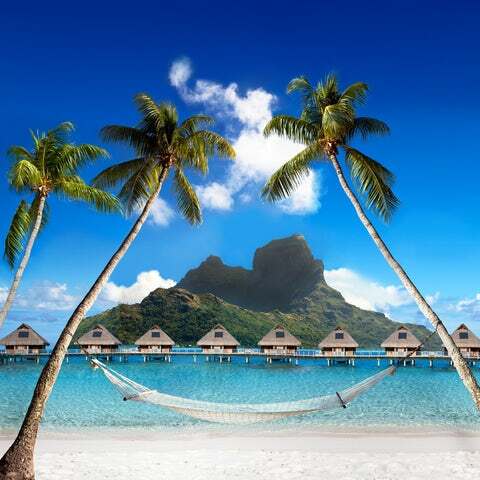 From here you will see the stunning and magnificent of Bora Bora Island in a perfect way. So if you guys are looking for an exclusive while enjoying vacation, can go to this island.